certainly not our last decade. 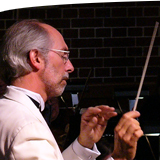 As Music Director, Eric Hansen does much more than conduct the orchestra. He selects each season’s repertoire, recruits soloist and new players and works with the concertmaster. For several years that was the incomparable Lenore Gilbert, and since 2013, Alexx Hinkle. Eric judges our concerto competition, and coaches the young winners as they adapt to performing with an orchestra. Eric works closely with the Board of Directors on the mission and mechanics of running the orchestra, including maintaining our relationship with our host, Merritt College. Eric keeps the Orchestra vibrant and ever-growing with challenges presented by the most beloved and most demanding symphonic works from the 18th through the 20th Centuries. This most recent decade, the repertoire he chose took us to great heights playing the most demanding music in the symphonic tradition, challenging our dedicated ranks of part-time, volunteer musicians who never fail to rise to the challenge of presenting five professional level concerts every season. In addition to familiar works by Mozart, Schubert, Schumann and the Three B’s (Bach, Beethoven and Brahms), we performed all the “greats” including Bartok, Berlioz, Bernstein, Bruckner, Copland, Dvorak, Elgar, Mahler, Mendelssohn, Nielsen, Prokofiev, Ravel, Rimsky-Korsakov, Rachmaninoff, Shostakovich, Richard Strauss, Stravinsky and Tchaikovsky. We will culminate the last season of the decade with Beethoven’s masterpiece, Symphony No. 9. Every season and every concert in this latest decade has been memorable, with all members of the orchestra contributing to great music. Eric has continued our tradition of tapping a few orchestra members for special performances. One was the 2006 world premiere of Summer Breezes, written by our own Tom Baker, composer, pianist and a long-time member of our viola section. That same season, two of our concertmasters, Ann Ryu and Jane Herr (whose mother Valerie Herr plays cello with us), joined in Vivaldi’s dazzling Concerto for Four Violins in B minor. Also, Ron Cohen was featured in Mozart’s Trumpet Concerto and Catherine Jennings performed Reinecke’s Concerto for Flute and Orchestra. In 2008, she was featured in Bloch’s Suite Modale for Flute and String Orchestra. In 2010, Adrienne Chambers played Richard Strauss’s Horn Concerto No. 1. In 2011, our brass and woodwinds presented Richard Strauss’s Suite for 13 Wind Instruments. One of Eric’s great talents is choosing music that pleases our listeners as well the musicians. In a volunteer orchestra, the members’ only pay is the “standing O” that our loyal audience often gives us. We may not reach the subliminal heights of the San Francisco Symphony, but we play the same demanding repertoire. In this decade, we have reached out to the many senior residences in the East Bay, and are gratified by those that bring seniors to enjoy concerts, intentionally held on Sunday afternoons to give senior citizens and families with children a chance to enjoy classical music. Our full houses of enthusiastic friends and fans and their generous donations tell us our efforts are appreciated. Because of their support, we are able to continue our tradition of five-concert seasons with free admission. We are also deeply grateful to Alameda County for its ARTSFund program. We are fortunate to have received their grants, given to support arts in our community. We celebrated our 40th Anniversary at the beginning of this latest decade. Our Gala Anniversary Concert in 2005 featured noted Bay Area violinist Robin Hansen, Concertmaster of the Midsummer Mozart Orchestra (and sister to Eric Hansen) and Anna Kruger, violist with the S.F. Ballet Orchestra, in a scintillating performance of Mozart’s Sinfonia Concertante for Violin and Viola. That season we featured concertos by members of Prometheus: Catherine Jennings with Reinecke’s Concerto for Flute and Orchestra, and Dorinda Chase and Jessica Cande with Bruch’s Concerto for Clarinet and Viola. The orchestra itself was a star in a series of challenging performances, that included Beethoven’s Symphony No. 8, Respighi’s Pines of Rome, Berlioz’s Symphony Fantastique. Our Khuner Young Artist Concerto Competition, for the 18 and younger set, continues to thrive. The Orchestra’s 50th Season marks the Competition’s 26th year, during which it has revealed startlingly gifted young musicians. The Bay Area is blessed with great music education programs in our public and private schools, access to the best music teachers, and youth orchestras such as those sponsored by the Symphonies of San Francisco, Oakland, and San Jose. See the Khuner Concerto page on our website for the complete list of winners. Cellist Tessa Seymour was also 12 when she won in 2005, entered Curtis Institute at age 16, has performed at Carnegie Hall and on “From the Top” on NPR. See the Khuner Concerto Competition page of our website for every winner. The great majority attended prestigious music schools and are professional musicians throughout the U.S. and Europe. This story is being written in the midst of our 50th Anniversary Season of 2014-2015. Eric Hansen has led us forward for the past 17 years to this remarkable moment in our history. Every year in this most recent decade has been marked with great performances and an ever-evolving roster of dedicated musicians. Nobody would be more pleased than our founder, the late Randy Hunt. On November 16, 2014, we pulled out the stops for a Gala Concert and Reception to open the season-long celebration. We played Leonard Bernstein’s Symphonic Dances from West Side Story, topped by a stunning performance by cellist Oliver Herbert, our 2013 Khuner Concerto Competition winner, of Tchaikovsky’s Variations on a Rococo Theme. The standing room only audience of over close to 400 broke our record and many stayed for the champagne and birthday cake gala. Special guests included former members who came back to honor the day. “Longevity certificates” were awarded to several current members who have played continuously with the orchestra for more than 20 years, two of whom have played for more than 40 years. Two former Music Directors were guests of honor – Roy Bogas (1976) and Jonathan Khuner (1980-1992). 50th Season finale: The Celebration continued for the entire 50th Anniversary Season of 2014-2015, the climax being the May 17, 2015, performance of Beethoven’s masterpiece, Symphony No. 9 “The Choral” with a chorus and nationally recognized vocal soloists: Raeeka Shehabi-Yaghmai, soprano; Jennifer Boesing, mezzo-soprano; Mark Narins, tenor; and Eugene Brancoveanu, baritone. The Season ended with a champagne reception for orchestra members and the audience, which was the largest ever to attend a Prometheus concert.